2015 I WRAPS I 27 W hen you consider all available markets, the vinyl business is infinite in scope. The white vinyl we all print on can become anything we choose. So with that in mind, it can be said that the image we print on that vinyl will determine who buys it, who's attracted to it, and what market it will be sold into. At the end of the day, it's the artwork that sells the vinyl in any market. 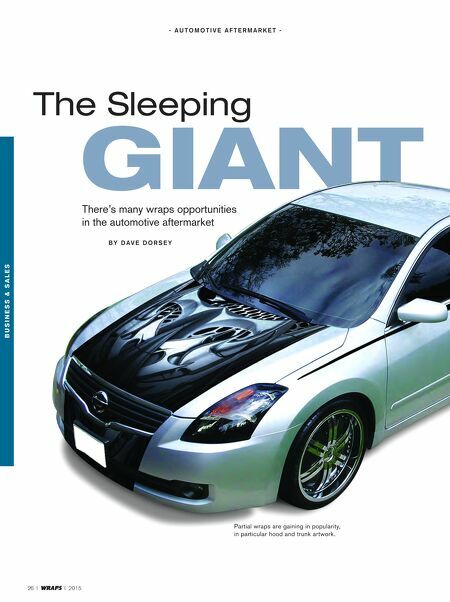 While most people in the vinyl sign business tend to cater to businesses, doing commercial wraps and partials, the real sleeping giant is the retail market for custom printed vinyl—custom cars, trucks and motorcycles. The biggest trade show for the automotive aftermarket is the SEMA Show, held the first week of November in Las Vegas every year. The attendees are largely business owners who are somehow involved in the automotive industry, or the automotive aftermarket. The automotive aftermarket industry alone is huge, worth billions every year. Are you getting your share of profits from this industry? If you answered no, you're the guy I want to talk to. 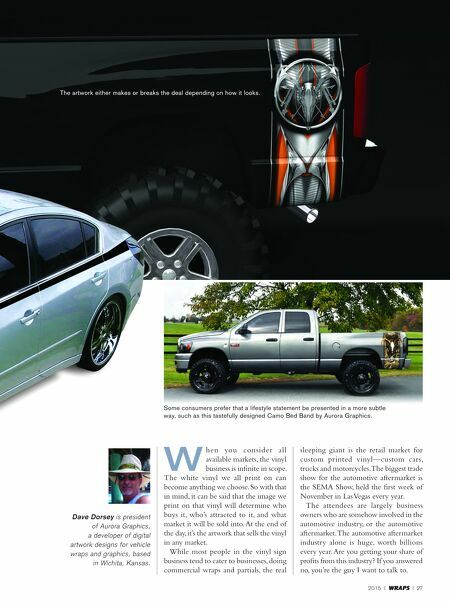 Dave Dorsey is president of Aurora Graphics, a developer of digital artwork designs for vehicle wraps and graphics, based in Wichita, Kansas. The artwork either makes or breaks the deal depending on how it looks. Some consumers prefer that a lifestyle statement be presented in a more subtle way, such as this tastefully designed Camo Bed Band by Aurora Graphics.